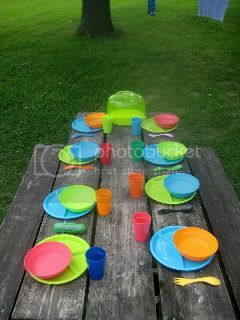 It is time once again to pull out the picnic and camping gear and set out on many family adventures. 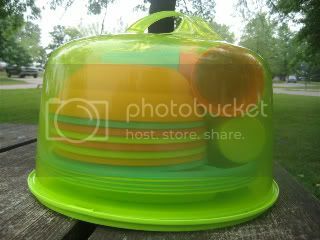 This is our picnic/camping "party ball" that I put together. I remember trips as a child and my mom had something similar, only not as functional, and much higher priced. It only served 4 (maybe 6, I dont remember!) 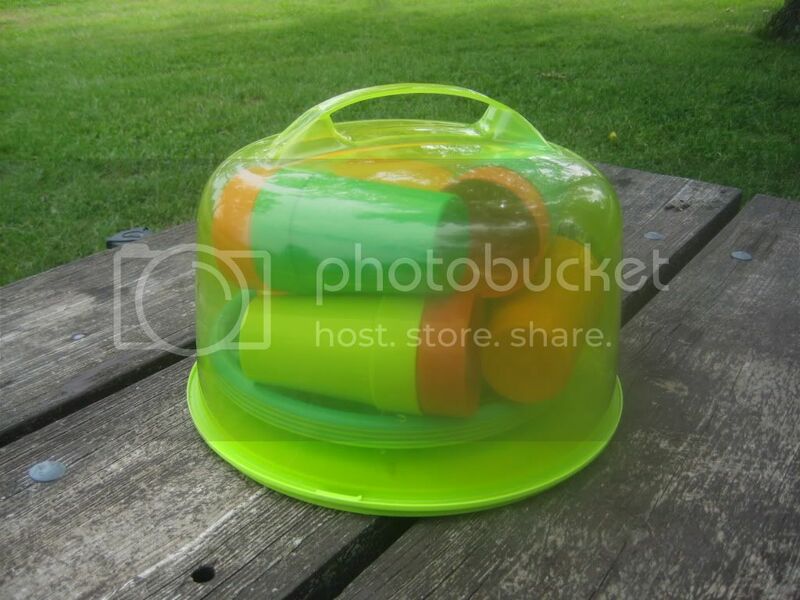 Anyway, this lovely little self contained feeding and eating aparatus has full place settings for 8 and is highly portable for those last minute "bring your own table service" outings. It's also environmentally friendly as there is no trash to throw away. If you are just picnicing for the meal, you can just close it all up and bring it home to wash. When I am camping, I always throw a pot of water on the fire when cooking so I can wash it up for the next meal. The cake taker can also be used as a serving bowl and serving plate. I usually stick the handle into the groove of the picnic table to keep it flat. Just make sure you are not putting hot foods into it.